It’s freebie day! Let’s get into these free books. 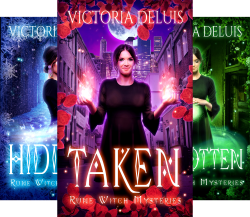 But first, consider purchasing this Taken from author Victoria Deluis. Grab Taken at Amazon, Apple, Barnes & Noble, Kobo and Playster. 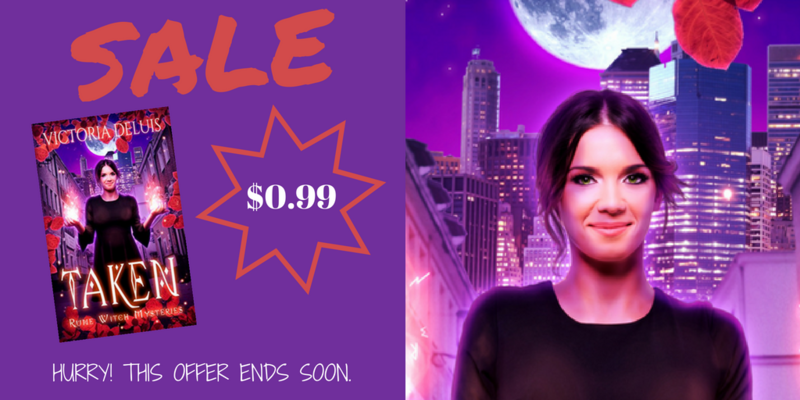 The other books in this series are also 99c each so be sure to check it out! It’s another week of freebies for ya! Take a peek at this curated collection. It hosts a good selection of genres I hope you’ll enjoy. Be sure to point a friend to the page and stop by next week for more! Oh, and don’t forget to pick up my book, The Proem. It’s free everywhere! Look on for this week’s freebies. For those who’ve read my Nome Chronicles books, you know that symbols are a big part of the series. Each family in the Group of Twenty has a symbol that represents them as well as their multiple business brands. I’ve shared the symbols at the back of the ebooks for The Pursual and The Paladin. I’ve also shared with my subscribers (have you subscribed yet? You’re missing out, if not!). An example of an insignia is on the cover of my books as well. That one belongs to Nome Reffour, Neith’s family. If you follow me on Facebook, Twitter or Instagram, then you know I survived Hurricane Maria. It hit the island I live on as a Category 5 storm. A weather gauge located two miles from my home recorded 225 mph winds during the weather event. Scary! Anyway, all that to say – there’s been a good reason. I eventually had to put a halt to The Pact (intended to be a story about the origins of Nome society from the perspective of one of Invier’s ancestor), The Pairing (a story about Lance Singer, Enyama Damil and Adaora Opitz’s complicated and hilarious love triangle) and The Pith (what happens in between The Pursual and The Paladin – didn’t happen because I thought it best to just put that story into The Paladin). And as for The Phalanx, I wanted it to be a story in the future that shows what becomes of the artificial intelligence soldiers that play a key role in the series. Maybe I’ll get to write these additional stories someday. I truly hope so. But for now, I’m working on two new series. The first, coming February 2018, is The LegionBorn trilogy. It’s an urban fantasy series with an interesting take on celestial beings and the humans who just happen to get caught up in their battles. Lucifer has a twin brother whose son might be the subject of a prophecy that could spell the devil’s downfall. As you can imagine, family ties mean nothing as Lucifer wants his nephew dead. Immediately. The second, coming April 2018, is The Excelsia series. I’ve been working on this universe for almost five months. It combines my love for strong female young adult characters but is set in space. Think a young girl in a universe that’s controlled by powerful corporations, religious zealots and underground elements all in a quest for control of the future of humanity. And that’s it for now. Let me know if you are interested in joining the launch team for any of the upcoming books I’ve mentioned. I’m looking for folks willing to read an early version of each book and leave their honest reviews when each of the books are launched. Want something nice this weekend? Valentine’s Day is over but the love keeps on giving. Consider the Cross Genre Book Showcase #CGNP! It’s got over 20 books for your reading pleasure! This Valentine’s season, I’d like to offer my short story, THE PROEM, for free. It’s a prequel to THE PURSUAL and introduces the main characters in the series and specifically, highlighting when Neith and Invier meet, and the romance that ensues. That introduction is the ball that gets the entire Nome Chronicles series rolling. And if you’d like an advance copy of THE PURSUAL as well, just become a VIP buddy by clicking here. Or, join Launch Team on Facebook right here. It’s a prequel to THE PURSUAL and introduces the main characters in the series and specifically, highlighting when Neith and Invier meet. That introduction is the ball that gets the entire Nome Chronicles series rolling. And if you’d like an advance copy of THE PURSUAL as well, just become a VIP buddy by clicking here.